Mina is a precious little girl recently rescued from an orphanage in Eastern Europe who is now finally home with her forever family! She had been without a mother or father to love her & care for her each day. No one to rock her, kiss her gently or tell her she's loved. She is blessed with an extra chromosome known as Down syndrome, which for her that meant a life of being viewed as worthless in the country she was born into & a life without hope. Because of this her parents gave her up at the age of 6 months when they found out the diagnosis & from there her life progressivly went down hill. We are the Gower family residing in OKC who recently adopted this little angel. She was extremely malnourished and unable to do just about anything when we first met her. She will be 2 in January & is the size of a 3-6 month old weighing 14lbs. She continues to amaze us at how quickly she is progressing with love and nutrition. She has learned to sit up, roll over, feed herself finger foods, hold her own bottle and loves to interact with toys and other children. Her life has changed so much in such a short period of time and will forever be changed! Thank you Lord for putting a burden on our hearts to rescue this little blessing and making her apart of our family! So we brought the sunfaded slide inside for some awesome physical therapy for Mina. 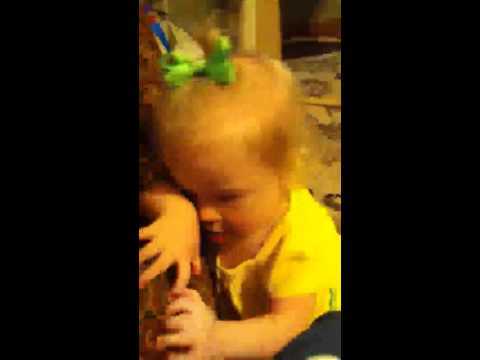 She loves it and has mastered it all by herself! She is doing awesome! Weighs 21pounds now and is working on walking while holding our hands! We are so proud of how far she's come!! Love our precious girl! 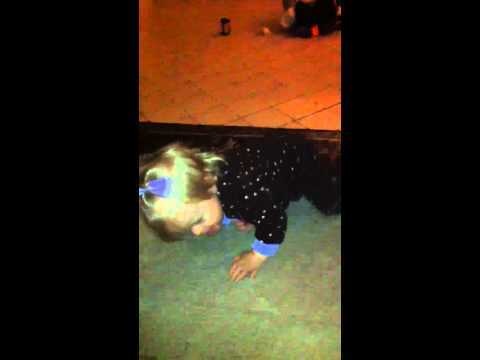 Mina can now successfully crawl up stairs. We have been spending a lot of time at my grandma's house who was diagnosed with 4th stage lung cancer back in December to spend as much time as we could with her in her last days. Unfortunately she actually passed away on March 17th. She was an amazing woman and one of my best friends in the world! She was Mina's biggest fan & was a huge reason & contributor in love, support & prayer in us bringing mina home. I am so proud of her. She is constantly gaining muscle and getting closer and closer to standing up & pulling herself up on things. She has come such a long ways! Introducing Miss Serenity Piper Gower!! Our sweet Mina saw Serenity from a distance the day she was born but didn't get to meet her till a couple days later. She had 102 fever, bad cough and runny nose so she got to spend a couple days with Oma and Papa. It was really hard for Jim and I to not have her with us and that she didn't get to meet Serenity right away but we didn't want to risk her getting sick.... plus we knew she was in very good hands and they definitely spoiled her. She spent most her sick days sleeping in her Papas arms and being snuggled. Oma (my mom) made this special outfit for her as her going home from the hospital outfit and to have as a keepsake to pass down to her kids. My mom kept my outfit from when I was a baby which Myla wore home from the hospital and will have to pass down to her children so my mother made this special outfit so Serenity would have something as well. I woke up with contractions around 4:00am and laid in bed about 30 minutes trying to go back to sleep and couldn't. I got up took a shower and realized the contractions keep coming and I was in labor. I woke Jim up around 6:30 to let him know and then I just worked on packing our bags and cleaning. After Jim got around he left the house around 8 to go get the videocamera from the office. (Which I found a bit humorous cause he left right before the girls woke up.) So that meant I got both of them up and ready for the day occasionally having to stop when I'd have a really painful contraction. My mom came by around 10 to pick up the girls and I just continued doing things around the house and pausing & squeezing pressure points when I'd hurt really bad. My contractions started out lasting about 1 minute long and 2-3 minutes apart. Then the part that threw me off was that my contractions were getting much more painful but further apart. Finally after tears during a few contractions I told Jim I thought we should go ahead and head for the hospital and literally a minute after saying that I was having back to back contractions and in a lot of pain. So I wanted to labor at home as long as possible and thought it would be ideal to arrive at the hospital about an hour or 2 before she was actually born. Well apparently my timing wasn't very accurate in when I thought she would arrive because all of a sudden I was in transition labor and having back to back painful contractions as we tried to hurry to the car to drive about 20 minutes to the hospital where my midwife was to deliver. I literally prayed the entire car ride as I had constant contractions and asked the Lord to please help us make it to the hospital because I didn't want to deliver in the car. We pulled up at valet and the man asks "Should I get a wheelchair." Jim told him yes which thankfully I didn't try to walk up cause she would have been born in the hallway then :) Once he wheeled me up to the labor and delivery floor in the triage room to get checked in the nurse tried to get me up out of the wheelchair into the bed. I sat there through another painful contraction and then tried to stand up to get in the bed and started having another painful contraction. I told Jim I felt like I needed to go to the bathroom and he was rushing around like a crazy person trying to quickly line the toilet with a layer of toilet paper & get back over to help me LOL. As I stood leaning over the bed I felt a big gush... my water breaking and the baby was coming. The nurse had left the room a minute and I told Jim go get somebody the baby is coming and I just kept thinking I'm going to have to catch this baby myself. So in comes running 2 nurses trying to get me to get up on the bed so I didn't have her on the floor. Within a minute or two after that in comes my midwife and Serenity is born. My doula unfortunately missed the delivery by a minute. She had a really short umbilical cord so while we waited for the cord to stop pulsating to clamp it she rested on my belly :) She nursed for about 4 hours after that. It was such a crazy hectic time and not quite how I'd imagined it but everything worked out perfectly and what a wonderful experience it was. We are so thankful for our newest little blessing! 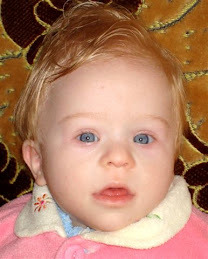 We stayed in the hospital 24 hours so that we could get the hearing test and pku done as well as social security paperwork and birth certificate. Myla came up to the hospital to help us take her home and she managed to lock herself in the bathroom in our room right as we were trying to leave. It took maintenance about 25 minutes to get her out of the bathroom. Poor baby was a bit tramatized and had her pants around her ankles when they finally got the door open. Guess she was to scared to pull her pants up once she realized she was locked in. Once we left the hospital we took Serenity by my grandmas house. It was really important to me and to her because her health is not very good as I've posted previously. She has stage 4 lung cancer which is rapidly spreading through her body and she continues to decline. Please lift her up in your prayers as well as my family! Serenity with her great grandma!! January 15th was Mina’s 2nd Birthday!! It was such a joyous day because it was her very first birthday spent with family and her birth is definitely something to celebrate. Mina was sick on her birthday with 104 degree temp so we didn’t get to go out or take her to do anything exciting on her special day and her birthday party had to be postponed to a later date which was a little disappointing. However the day was spent with a lot of snuggle time with mommy and daddy. We lounged around all day (because we all were sick with the flu read about it here) and watched movies and spent time together as a family. We had her 2nd Birthday Party on January 22nd and she sure had a great time. She got to color on the wall :) dig her face into a huge cupcake and open lots of presents. She absolutely loved it!! Needless to say she was on a sugar high and didn’t fall asleep till close to 11 that night. Mina has come so far in just 5 months and it is so amazing!! She has been just blossoming before our eyes. We are so thankful for her birth and that we were blessed to adopt her and that she is apart of our family! She is such a joy in our lives! "I think I'll take this one"
"Look at all my cupcakes!" "What am I supposed to do with that?" "I think I'm really starting to like this stuff!" Kisses for the birthday girl from Mom & Dad! All Done!!! Time for a bath! HAPPY BIRTHDAY TO OUR PRECIOUS MINA!! WE LOVE YOU, LOVE YOU, LOVE YOU!! 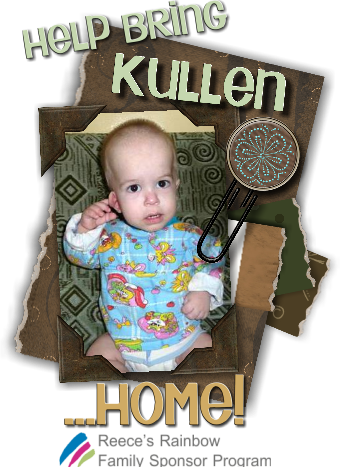 A friend of ours recently adopted a precious little boy named Kullen from Ukraine. You can read about their adoption story by clicking here. They are advocating and trying to help raise funds for another family who is adopting a precious little boy named Carson with EB (epidermolysis bullosa- a rare genetic skin disease that causes the skin to be so fragile that the slightest friction can cause severe blistering–inside and outside the body.) 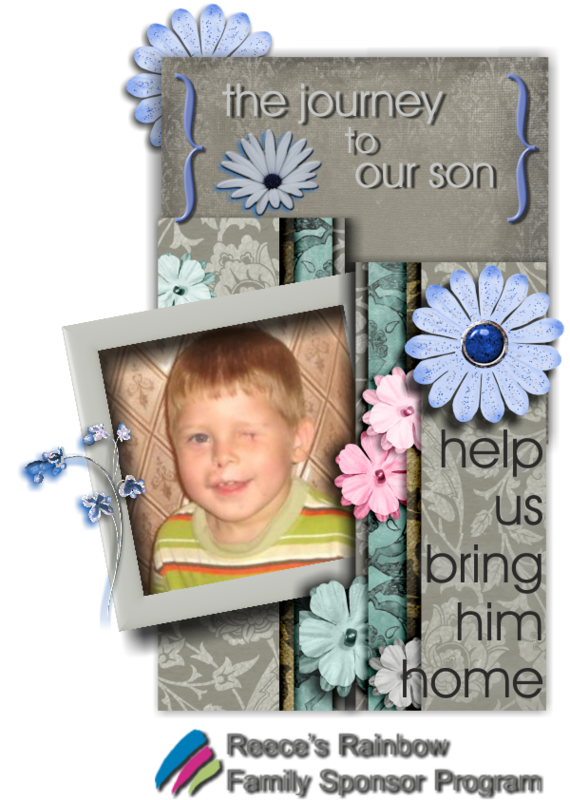 They have a daughter who has EB so this is something that is very dear to their heart and they are working hard to try to help raise funds for another family to be able to bring this boy home and give him a better chance and quality of life. You can read about the family who is working towards bringing Carson home here. We had sent them a set of 5 Ukrainian stacking dolls for them to fundraise for their adoption and they are actually using them to fundraise for this other family instead. Everyone who donates through the chip in on their site will be entered into a drawing to win this set of dolls we bought in Mina's country. 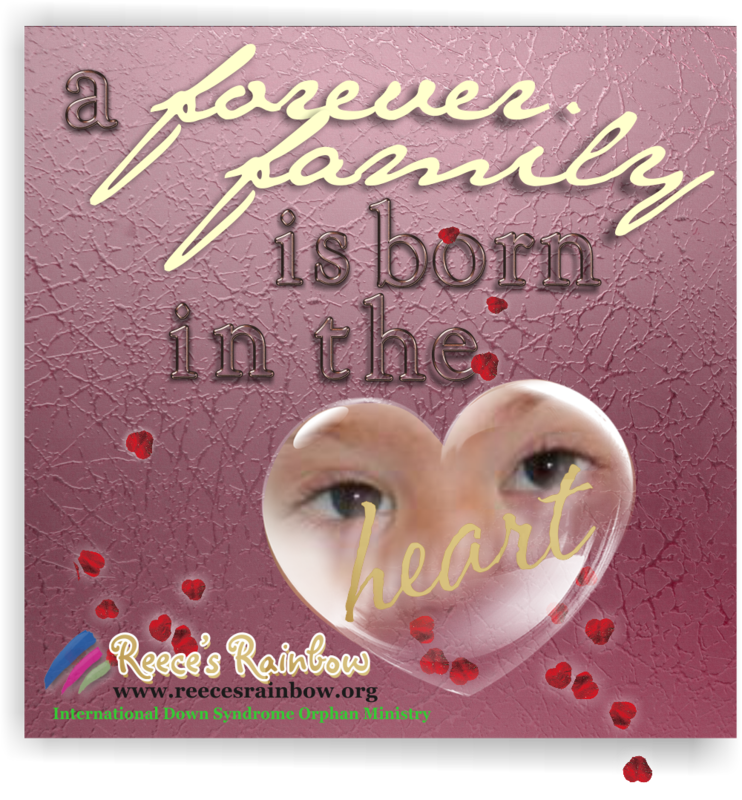 The donation will go directly to Reeces Rainbow for the Cannell family and is a tax deductible donation!! Please head over to their website and read the full story and details and help save this precious boys life. Our lives in December~ Lots of pics!! Here's an updated post with lots of pictures as promised! Check back for a January updated with Mina's 2nd Birthday pics coming soon! This December was Mina's first Christmas holiday season with family who loves her very much. We tried to make the best of our situation and illnesses and did what we could to still make Christmas time fun, festive, and celebrate Christ's Birth! In the midst of our madness here’s the fun things we managed to do. Picking out our Christmas tree. Look how tall it is!! Mina's 1st tree!! Our little Christmas angels!! Oh how these sisters love each other!! We went to the Harn Homestead Christmas lights event. Mina is petting a horse with Aunt Danie. We got to go on a hay ride, take pictures with Santa, decorate cookies, and play some fun games. Big Smiles!! Happy girl enjoying every minute!! Mina at the hospital visiting Mimi (her great grandma who was recently diagnosed with final stage of lung cancer) Oh how her mimi adores her. Please keep her in your prayers!! She is one of my best friends in the world and I can't imagine life without her in it!! She's been told she has a year left but we're praying for a miracle! Well December 23rd we were just about sick of being couped up in our house for weeks on end and not being able to get out due to the shingles and chicken pox so Jim loaded us all up (the girls in pajamas :) and took us out to Chickasha for the lights festival. Since we couldn't be around people it was something perfect that we could do together as a family and the girls really enjoyed the road trip and seeing all the Christmas lights. We stopped by Jakes Ribs and Jim grabbed food to go that we ate in the truck while enjoying all the lights. Our poor babies and their chicken pox. I am so thankful that is all over!!! Christmas morning at our house! This year was the first year we didn't spend Christmas day with our families... which made me sad... although we enjoyed our time together with just us. All the past years we spent the night at my parents and wake up altogether and the cousins all get Christmas morning together. Then after spending the morning with my family we go to Jim's parents and spend the rest of the day with his family. Well this year was the first to wake up in our own home and not do those things since the girls had the chicken pox and couldn't get around the other kids. It was a wonderful day and we enjoyed our time together celebrating Jesus. We didn't really do anything big for Christmas as far as presents goes.... for one Jim had spent so much time off work from everything and we want to keep it a bit more simple and try to keep the focus on Christ and the reason we celebrate Christmas. Hopefully we can instill in our girls the giving rather than receiving. Myla got a new bigger piggy bank and she wanted to give her other one to her sister. Very sweet! Mina got letters of her name for us to put on the wall in her room! In the evening Christmas day after everyone was leaving we went by my parents for a little bit to see them. Mina in her Christmas jammies sitting on Oma's counter. Papa is making her laugh! Decorating a gingerbread house! Well and eating all the candy :) Mina really liked the icing. The rest of our December was spent playing, coloring LOTS, and a ton of snuggle PJ time! Our Gift from God- Myla! We are the Gower family!! I'm married to a wonderful man and my best friend, Jim for going on 7 years now. We have a little girl named Myla who is 2 & adopted Mina in Sept(she will be 2 in January), and I am pregnant with a little girl and due in February. Little did we know after we said Yes to the Lord and His calling to adopt precious Mina that He would bless us with another gift. So now we will have 3 little girls 2 and under. We are so thankful for our precious children & think they are gifts and blessings from the Lord. My husband is self employed and does videography work and I stay at home with the girlies! Life Church is our church home and where we serve! We are just living life striving to go against the grain of this world and follow God each step of the way! We believe we are created for a purpose and daily strive to fulfilling that which we were created for! CLICK HERE to Put the Angel Tree Bubble on Your Blog! Thank you! Defend the orphans & the weak, Defend the rights of the poor & suffering. Save the weak & helpless from the power of the wicked! 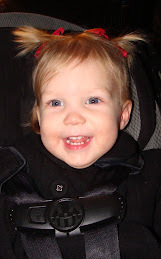 2/15/2010 Inquired about Precious Mina! 5/21-23/2010- HUGE Benefit Event 4 Mina~ Raised $3,600! 6/7/2010 Dossier Off! Should arrive Wednesday! 6/9/2010 Dossier Delivered to Mina's country! 6/17/2010 Dossier Submitted to SDA Office! 7/1/2010 Received SDA appt date: Aug 3, 2010! 7/31/2010 Flying out to Meet Mina! 8/4/2010 Received permission to visit Mina! 8/5/2010 Met our beautiful girl Mina! 8/10/2010 Court to become Mina's parents! 8/21/2010 10 day wait period is up! At last Get Mina out of the orphanage for Good! 9/3/2010 Fly back home! Horray! !